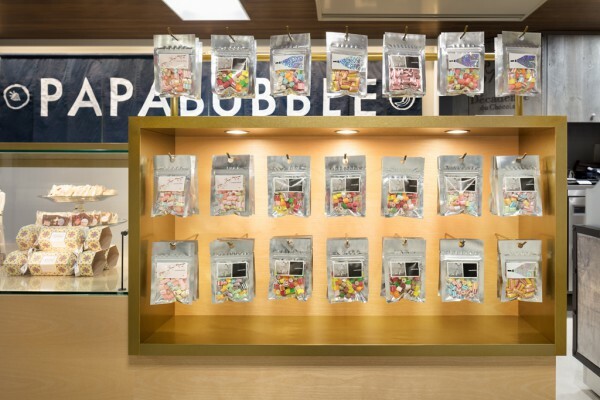 We performed the interior design for papabubble, a Spanish candy artisan, which opened a small art-candy-store on a tiny 9.2m2 lot inside the Keio Department Store's Noren Shopping Street located within the Keio Shinjuku station. Noren are traditional shop curtains and the shopping street named after them is an area where counters selling candy and tea, etc., are lined up on one side of the walkthrough of Shinjuku station. We conveyed a high-quality brand image by accentuating the expressivity of materials such as wood, metal and glass found in the display counter space extending the entire frontage. Different product display methods become apparent from the shape of the large counter which features a stair-shaped area, a glass case showcasing gummies and a box with hooks for holding bags of candy. Furthermore, a monochrome background was used to increase the visibility of the product counter, behind which can be found the register and workspace. The full-length indigo dyed shop curtain was designed as a signboard and as a nod to its location in Noren Shopping Street.